These amazing ingredients ensure this recipe is packed with all the traditional Cajun flavors! Today’s #LunchBreakLIVE features vegan activist and artist Lindsey Baker, who is also a contributor for JaneUnchained News Network. Traveling to New Orleans, Louisiana to see if veganism was catching on there. 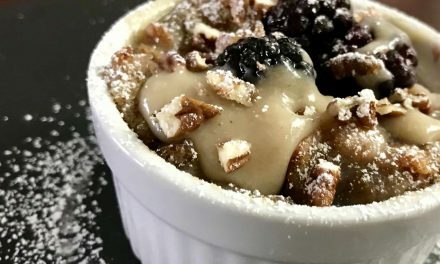 Lindsey discovered, through her vegan food crawl, that veganism is exploding in the crescent city! Watch as she creates two delicious traditional New Orleans’ dishes, veganized. 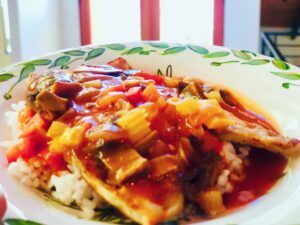 Learn how easy it is to make your own vegan version of etouffee and red beans and rice with vegan sausage. Utilizing products she purchased at her local grocery store, a nationwide chain, Ralphs, including Krogers Warehouse‘s vegetable broth, Field Roast sausages, Zatarains seasoning “boil”, Wright’s Liquid Smoke, McCormick Gourmet organic seasonings, Lindsey’s dishes are spot on with Cajun flavor. In true New Orleans style, Lindsey poses with an ornate mask! Lindsay has lent her beautiful home to charities that help animals. 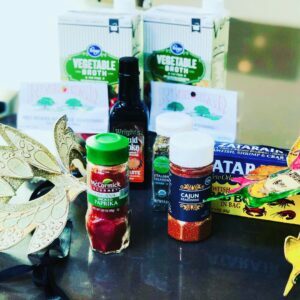 Recently, she accomodated a fundraising brunch with The Physicians Committee for Responsible Medicine to raise money for a vegan dog food study. The event successfully raised the money needed to conduct the study. The goal of the study is to demonstrate the effects of a vegan diet in canines. Hopefully the results from the research will save countless lives of our companion animals and the animals that are killed to feed them. Lindsey has also been very involved with the Animal Hope and Wellness Foundation, which is an organization that has rescued several animals from the dog meat trade overseas and has done a countlesss amount of good for all animals. 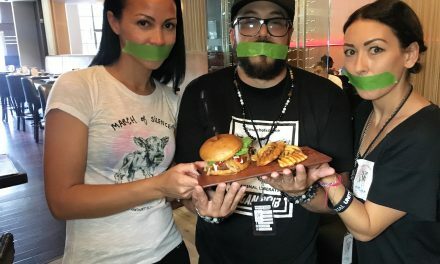 Now we are happy to have Lindsey as a JaneUnchained contributor, reporting LIVE from the field, and sharing her fabulous vegan cooking skills with us! This Etouffee is looks like a Mardi Gras party for your mouth! Lindsay prepared the red beans ahead of time which has the Cajun style “trinity” in it, comprised of onions, peppers, and celery. Next Lindsay makes the roux which is a creamy mixture made with vegetable fat instead of animal fat and flour. The roux is traditionally used as a base for soups and other creamy creations. Liquid smoke is the secret ingredient to get all that smokey flavor in the pot. etouffee is a spicy Cajun stew traditionally made with seafood and vegetables. Lindsay is skipping the seafood and making this dish cruelty-free and just as delicious from scratch! Paige happily tries the red beans and rice and the etouffee when it is done and she says both are absolutely delicious! Paige really appreciates the diverse flavors and the way the eggplant in the etouffee mimics the seafood. Try bringing New Orleans home like Lindsay with her recipes below! Lindsey poses with her final delicious veganized Etouffee! Place 1 lb. of red beans in a 4 – 5 quart pot. Cover with water and soak for two hours – then drain. Bring to a boil, then reduce heat and simmer for 3 hours or until beans are tender. Serve over steamed white rice. Add salt to taste. Combine in pan and cook medium heat until golden but not brown. Add 1 cup mushrooms of choice, shiitake and oyster works best for Etouffée. Add 1/4 cup tomato sauce and 1tbsp. of smoked paprika and a tsp. of liquid smoke. LIQUID crawfish boil. It’s just seasoning. About a tbsp. Cook over medium heat until thickened to creamy chowder consistency. Serve over white rice or a thin, pan fried steak of eggplant. (dredge the eggplant in seasoned flour before pan frying). Not deep-fried. PreviousThe Best New Shop in Town, Besties Vegan Paradise! NextMeet The Pro Bodybuilder Who’s Never Eaten Meat!